This is a truly exceptional property in superb condition! Don’t miss this beautiful 3+den/2.5 bath bright, airy & rarely available Massiano floor plan. All living quarters are on one level. Perfectly situated with lake view! The interior features & upgrades include the popular, great room concept with twelve foot, tray ceiling. Additional interior features include warm neutral tone tile throughout the main living area, eight foot doors, crown molding throughout the home, impact glass windows & front door, bar-less "picture window" screen enclosure that provides unobstructed views of the lake. Additional shelving & storage has been installed the garage which also features a coated floor. This home is energy efficient - extra insulated foam injected into the block walls, insulated garage door & Ecobee thermostat. A complete list of upgrades & improvements is available upon request. 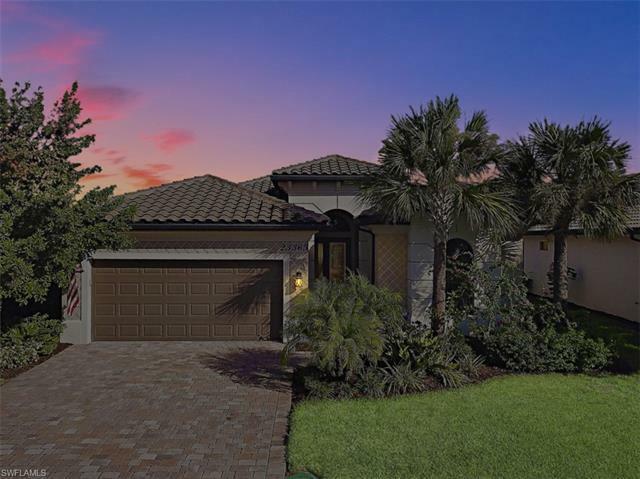 This home is located in the gated community of Bonita Lakes, a Toll Brothers community, one of the few areas with natural gas for cooking & hot water. Located a few minutes from shopping & dining at Coconut Point Mail, about 20 minutes to RSW airport & about 20 minutes to Bonita Beach & Barefoot Beach.